Video Slots are the hot game in the online gaming industry right now. These exciting, graphic oriented, games attract a large portion of the Casinos' business, and for good reason. They are quick paced, easy to learn, full of attention-grabbing graphics, and give players plenty of chances to win. The games come in a number of varieties, ranging from simple 3-reel, 1-line video simulacrums of traditional slot machines, to the complex video slots, with up to 7 reels and 25 paylines or more. Let's take a look at some of the more popular video slot games. Microgaming, one of the largest gaming software providers, has produced a number of excellent video slot games. With their smooth running graphics and fun themes, these games are star attractions at Microgaming casinos. Tomb Raider Slots, based on the popular video game and movie franchise, is one of the best known Microgaming video slots. The graphics are derived from the characters and storylines of the arcade games and movies, while the 5 reels and 15 paylines give this video slot more than enough complexity to keep players interested. The slot game frills are there, too. Tomb Raider Slots offers free spins, a bonus game, a wild symbol, and a scatter symbol. These interconnected features all add to the game's excitement, and increase your chances of winning. Lara Croft, the franchise's pistol-packing heroine, is the scatter symbol. Spot her twice on the reels, anywhere, and you'll win on the spin. If she turns up 3 times, you'll win 10 free spins- you won't have to place a bet to spin the wheel, and any win during those free spins is trippled. You can even win a trip to the bonus game during the free spins. Finally, the Tomb Raider is the wild card; see it on any payline, and it will complete a winning combination. It's easy to see why Tomb Raider has long been one of Microgaming's most popular offerings, but the company also offers several other “new classics.” Mega Moolah Slots won the ‘Best New Progressive Slot' award in 2006, and it's easy to see why. 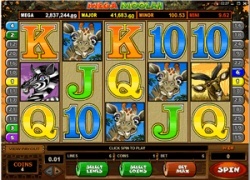 Featuring an African safari theme, Mega Moolah offers funny graphics, smooth reel action, and a chance to win huge jackpots. The monkeys, giraffes, zebras, and lions that show up in the reels are more whimsical than realistic, giving the game an appealing sense of fun, and the wild cards and scatters offer chances to win, as in any other video slots. Where Mega Moolah really delivers, though, is in the big jackpot. Because Mega Moolah is a progressive game, the main jackpot starts at one million (yup, you read that right! ), and simply keeps growing until someone wins it. The record win was more than four million dollars. With 5 reels, and 25 paylines, there are plenty of chances to win this Mega Moolah! Moonshine Slots is third of Microgaming's ‘best of the best' video slot offerings. This funny, redneck themed game pokes gentle fun at a side we all have, but only some of us show. With graphics depicting bean stew, fried green tomatoes, and pumpkin pie, all alongside a clumsy, tied-up Sherriff and a shotgun-toting Grandma, Moonshine feels like a surrealist take on the Andy Griffith Show. But that gentle surrealism will change when you hit the jug of moonshine, and start winning free spins and bonuses. This game offers big payouts, and with 25 paylines over 5 reels, there are plenty of chances to win. Wild and Scatter symbols (including that Grandma, who shoots at you when you win!) will add to the excitement. Microgaming may be big, and it may put out some great offers, but it's not the only game in town. There are plenty of other gaming software providers out there, and plenty of other great games. 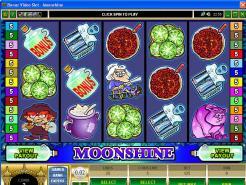 One example is Rain Dance Slots, and video slot game offered by Real Time Gaming (RTG). With 5 reels and 20 paylines, Rain Dance fits into the same general category as the games listed above. And it is similar. The games theme is the American Indian; graphics include a noble Chief, an American Bald Eagle, and a native war axe, or tomahawk. Rain Dance includes a wild symbol, free spins, and a large random jackpot. The difference is in the details. Coin size on Rain Dance can vary from $0.01 to $5; the main jackpot is an amazing 40,000 coins. Think about it: betting one coin, at the maximum value, can potentially return $200,000 on a jackpot. Not many games can match that. The free spin feature is also a potential huge winner. Triggered by the wild and scatter combinations, it's possible to win as many as 100 free spins! Together with the large jackpot, this gives Rain Dance one of the best winning potentials of any video slot game out there. All of these games are great fun. They offer real chances to win, and to win big, but even if you only hit the small jackpots, you're going to have fun playing the ‘new classic' video slots.